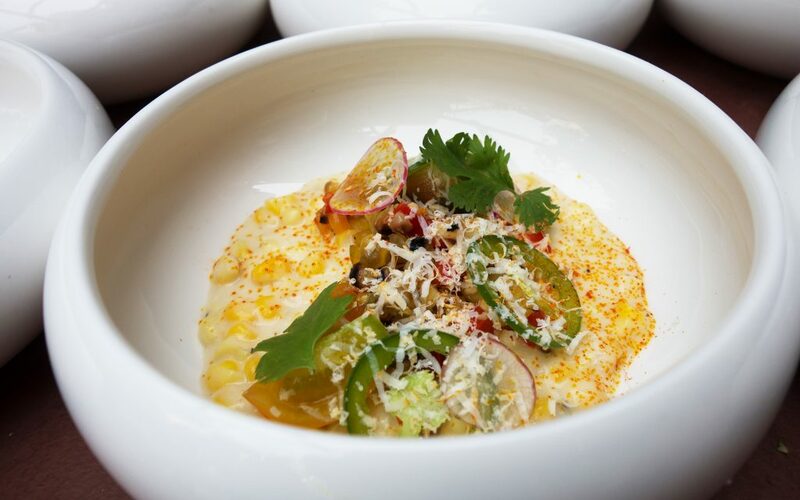 At Chef Manny Mendoza’s Herbal Notes, education is on the menu…along with shatter-crisp buttermilk curry fried chicken, pupusas califas, and an earthy chocolate mole de platano strewn with lavender buds and sesame brittle. People didn't just leave full, they left with a new understanding of food and cannabis as medicine. 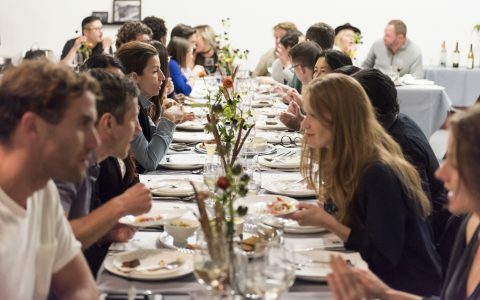 With his series of infused pop-up dinner parties, Mendoza hopes to give diners the tools they need to begin healing themselves through an interactive conversation around needs and resources. For him, the best place to have that discussion is around a dinner table. 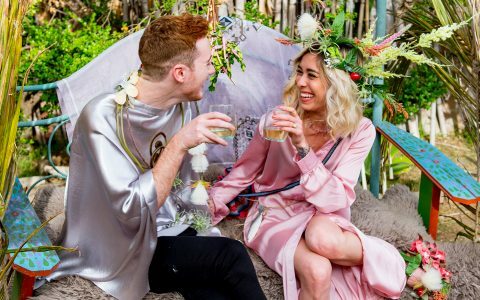 At a recent dinner series in Chicago, diners wandered through a hidden alleyway to find a secluded backyard full of fairy lights and foliage. The tables were decorated with cacti, candles, and serapes; the sounds of a burbling waterfall mingled with the DJ mixing the perfect house-party playlist. Herbal Notes’ mixology partner for the evening, Big Mich, greeted diners with a “Medicated Michelada” which included a rim of CBD-infused chile sal, aerosolized bitters, essential oils, and CBD tincture. 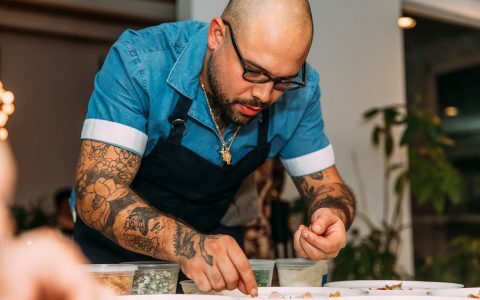 Utilizing extracts for precise dosing, Chef Mendoza presented a 20mg CBD:5mg THC dinner with dishes aimed to elevate the conversation surrounding cannabis. 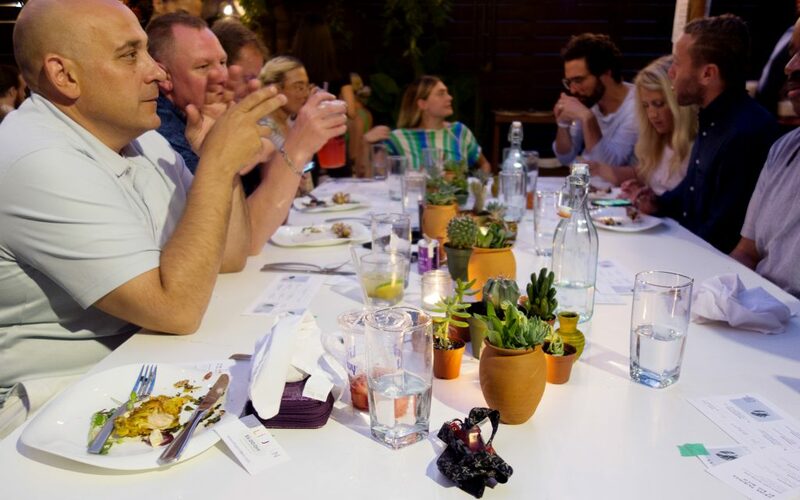 After seven courses and plenty of rousing conversation around the dinner table, people didn’t just leave full, they left with a new understanding of food and cannabis as medicine. 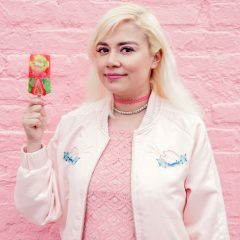 Mendoza was raised in a single-parent household in Pilsen, a vibrant Latinx neighborhood in the lower west side of Chicago. “My mom worked really late, so somebody had to cook. That’s how I started cooking,” he says. He began playing with ingredients, figuring out how to satisfy his older brother and sister with his first kitchen experiments. While he was a creative kid, sometimes his wild streak got the best of him. 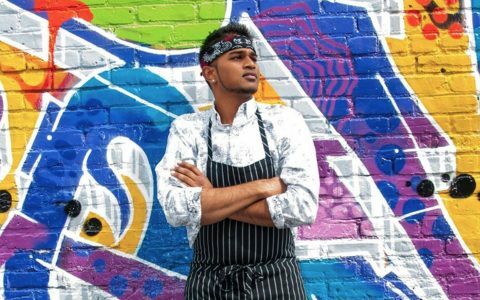 He struggled in school until he discovered Gallery 37, a city-funded arts program that offered free culinary arts training to teenagers. He credits that early intervention not only for guiding him on a path toward the Culinary Institute of America, but for setting the intentions of his career. After seeing gang violence, poverty, and suicide blight his community first hand, he resolved to use cannabis as a tool to heal the same populations that have been affected by criminalization. Mendoza is well aware of the barriers those on the South and West sides of Chicago face when getting certified for Illinois’ Medical Cannabis Patient Registry Program. There’s a lack of education around the availability of the card, the price of application, and valid fears around fingerprinting fueled by racial profiling, hyper-surveillance, and police misconduct that they experience in their day-to-day lives. As a cannabis advocate, Mendoza calls on the government to use tax revenue to revitalize communities devastated by the mass incarceration of the drug war. He wants to see the use of workshops and job fairs specifically for those formerly incarcerated on drug offenses. It’s about community, not just consumption. 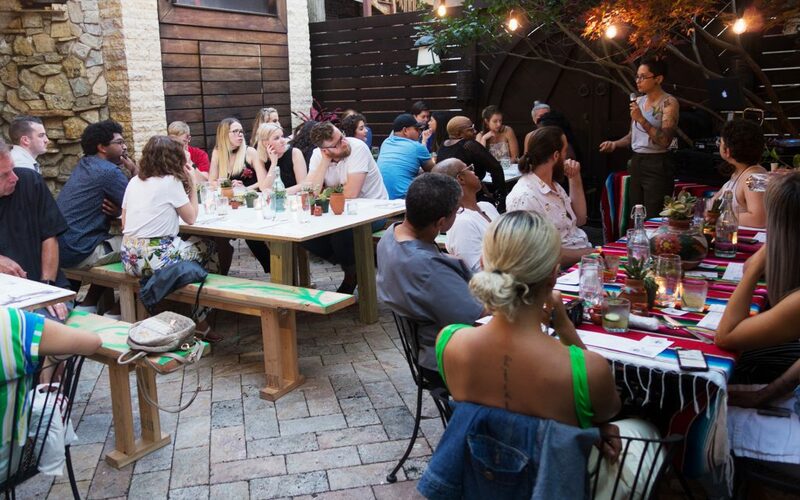 Using experiential dining as an educational platform, Mendoza’s fighting against the stigma that’s kept people in the shadows and behind bars. In addition to his ticketed dinners, he offers free workshops on whole-plant wellness with a focus on the phytocannabinoid spectrum, so attendees can better utilize cannabis to treat their depression, anxiety, and illness. You can begin understanding how food and cannabis come together when you realize how many similarities they have. Terpenes, the essential oils that lend plants their fragrance, are found in everything from red wine to kiwi fruit. That’s why a citrusy strain is the perfect thing to roll up with your dark roast coffee in the morning; the flavors work together, just like they do in a cafe de olla. During a recent dinner in Chicago, diners were served a tequila limonada garnished with Green Dragon raspberry caviar. As you squeeze the tiny spheres between your teeth, the thin skin bursts under pressure (think popping boba), your mouth floods with an herbal, resinous pine flavor from the strain’s humulene, the terpene that also lends coriander, cilantro, and hops their dankness. Mendoza likes to vacuum seal plant matter with a carrier oil and throw the resulting package into a warm water bath. Using the sous vide method allows him to control the process of decarboxylation, preserving lemony, floral, or sugary terpenes that may evaporate at higher temperatures. (Temperatures past 300 degrees are responsible for extracting volatile compounds like chlorophyll, which can transfer off-flavors to food). It’s not just terpenes that has Mendoza’s focus. He’s eager to share knowledge on how cannabinoids, the therapeutic chemical compounds found in cannabis, can help treat both mental and physical illness. For example, you might know that CBD-A is useful for the application of pain and nausea. “Other minor cannabinoids would include CBN, which is a byproduct of THC after it starts to break down due to excessive heat (or it starts to degrade into it over time). It’s used as a sleep aid—it kinda puts you to sleep and relaxes you,” Mendoza explains. “There’s THCA, the precursor to THC, which has its own anti-inflammatory benefits. It’s found just on the plant, readily available, so you don’t have to decarboxylate it to receive its benefits.” Mendoza recommends lightly blanching the fibrous leaves to toss in a salad. Along with all other minor cannabinoids, these chemical compounds all work together to produce the entourage effect. Though the minor cannabinoids occur in relatively small amounts, by working together they can produce a major effect on patient’s pain and mood. 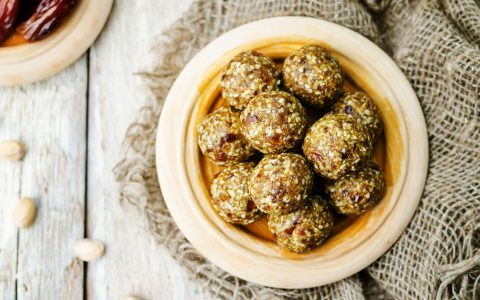 With his experience producing edibles and baked goods, Mendoza plans to eventually begin developing his own products to bring affordable, accessible medicine to a greater audience. “I just want to be able to start the company with a healthy, straightforward, clear goal of keeping it people-focused,” he says. “When I do get to the point where I’m manufacturing at scale, I know I could dedicate a portion of that to go back into the community. I don’t need ten million dollars … it’d be cool to give nine away, keep one,” he says with a laugh. Mendoza’s lived in California since 2015, and he regularly organizes events in San Diego. In addition, he partners with local creatives (like mixologists, entrepreneurs, artists, and DJs) to bring Herbal Notes to life in his hometown of Chicago and recreational-friendly Seattle, with more cities soon to be added. After the last tres leches crumbs are swept off the table, and after the high’s worn off, what sticks with guests is the knowledge they’ve acquired, as well as the empowerment they’ve received to treat themselves and their family members with cannabis.